In November and December 1965 Jonas Mekas presented an extensive series of multimedia productions in New York which included productions by artists such as Robert Rauschenberg and Claes Oldenburg. Mekas' series has often been referred to as the Expanded Cinema Festival but at the time that it took place it was actually titled the New Cinema Festival 1. 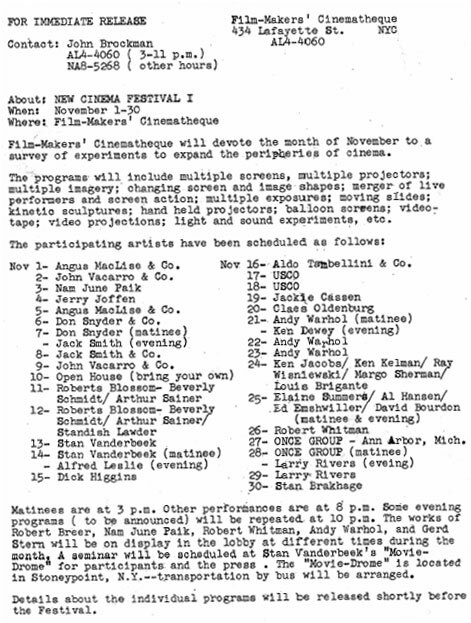 It was advertised as the New Cinema Festival 1and when Mekas referred to it in his column in the Village Voice at the time, he called it the New Cinema Festival. Yet, film writers continue to refer to it as the Expanded Film Festival. In his biography of Warhol, David Bourdon referred to the series as the "Expanded Cinema festival." Although it was an international phenomenon, occurring in a number of countries simultaneously, 'expanded cinema' gained prominence in the United States in late 1965, largely as a result of the New Cinema Festival at the Film-Makers' Cinematheque. Jonas Mekas staged the series and then praised it effusively as an exciting new development in his influential movie columns for the Village Voice. 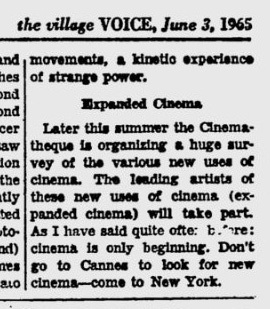 Mekas originally announced the festival in his 3 June 1965 column for The Village Voice under the heading of "Expanded Cinema," but when the festival actually took place, it was called the New Cinema 1 Festival. Although he mentions that the organization of the "huge survey" would take place later in the summer, the festival actually took place during November - December. Mekas does not recall why the festival was billed as New Cinema Festival 1 in the Voice: "I do not remember how the New Cinema title was concocted for the ads, but it was probably done by John Brockman whom I had engaged at that time as Program Manager and who had his own ideas how to promote the series. Our ideas about it differed so much that I had to eventually let him go." 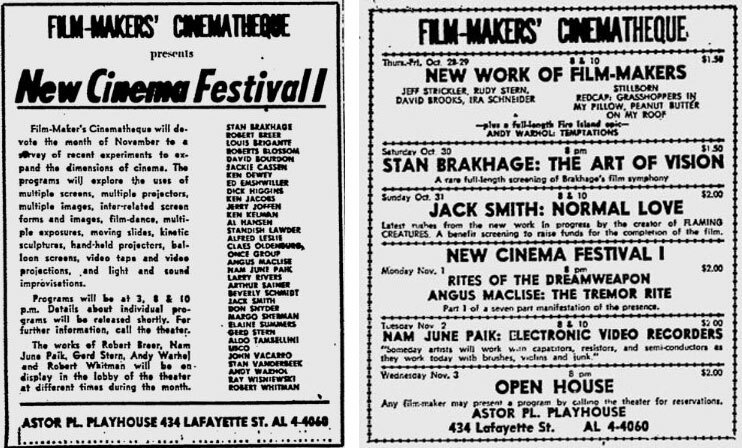 But a press release was also sent out where the festival was referred to as the "New Cinema Festival 1," giving Brockman as the main contact. "The date was September 4, 1966. I was sitting on a park bench on Labor Day weekend in Easthampton, Long Island, reading about myself on the front page of The New York Times Sunday "Arts & Leisure Section." I was wondering if the article would get me fired from my job at the New York Film Festival at Lincoln Center, where I was producing "expanded cinema" events. I was twenty-five years old. 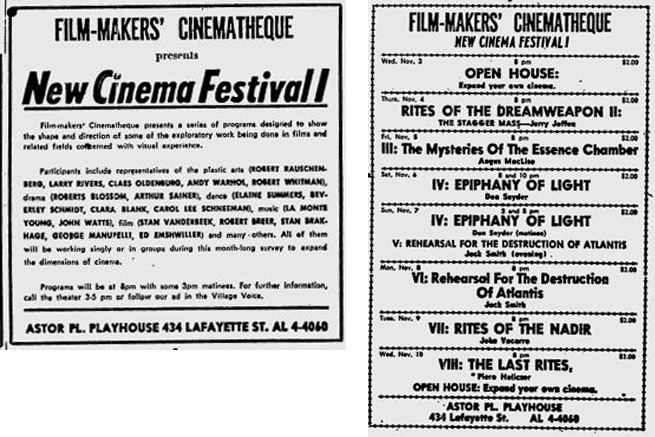 People who attended the festival would also later refer to it as the Expanded Cinema Festival, despite it being advertised as the New Cinema Festival I. Playwright Richard Foreman recalled seeing a Jack Smith event at the "Expanded Cinema Festival:"
During the second half of the sixties, when I was spending anywhere from four to seven nights a week at the Film-Makers' Cinematheque, not only was a vast quantity of film discovered and shown, but a significant number of theatrical events were stages, many of them created by filmmakers and artists for performance occasions offered by Jonas Mekas. 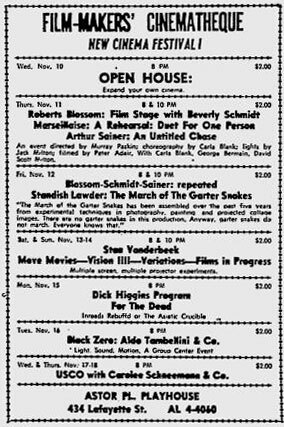 The Smith event was actually performed in November, as per the 4 November 1965 Village Voice ad below. There were two ads for the festival in that issue of the Voice - one announcing the festival in general terms and the other giving a schedule of events during the first half of November. In both instances the festival was advertised as the New Cinema Festival 1. Rites of the Dream Weapon - I - "The Tremor Rite"
Program notes: for New Cinema Festival I. Rites of the Dreamweapon is a seven-part "Manifestation of the Presence" coordinated by Angus MacLise. Reproduced in Angus MacLise - Dreamweapon catalog (p. 20). Program: for opening night "Rites of the Dreamweapon I | The Tremor Rite". Mentions "Music by: The Velvet Underground" (John Cale, Lou Reed, Sterling Morrison, Angus MacLise). Reproduced in Angus MacLise - Dreamweapon catalog (p. 23). In this instance Landemaine indicates the performance was part of the "New Cinema I Festival." 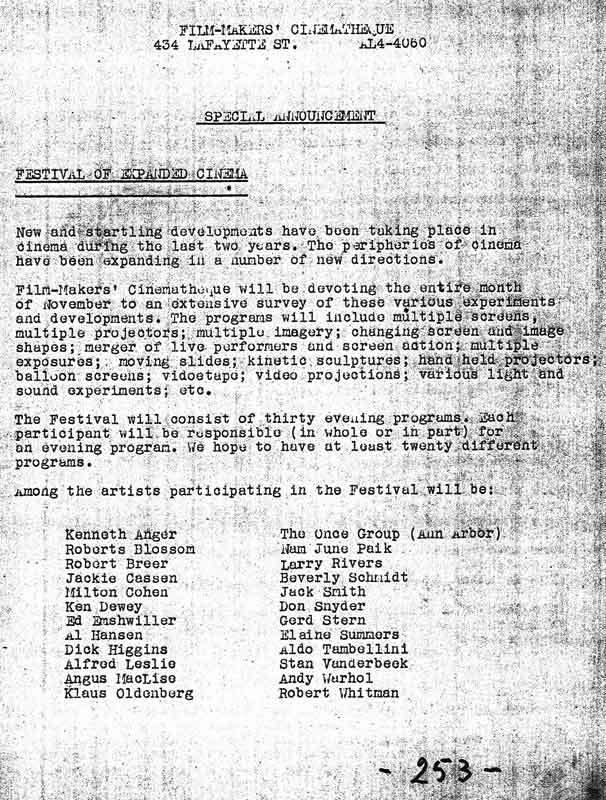 But in a description of the November 10th production of "The Last Rites," he identifies the festival as the "Expanded Cinema Festival." Program: reproduced in Pop Goes Art - Andy Warhol & Velvet Underground (p. 10). Mentions Angus MacLise as first cembalum and John Cale as first viola. 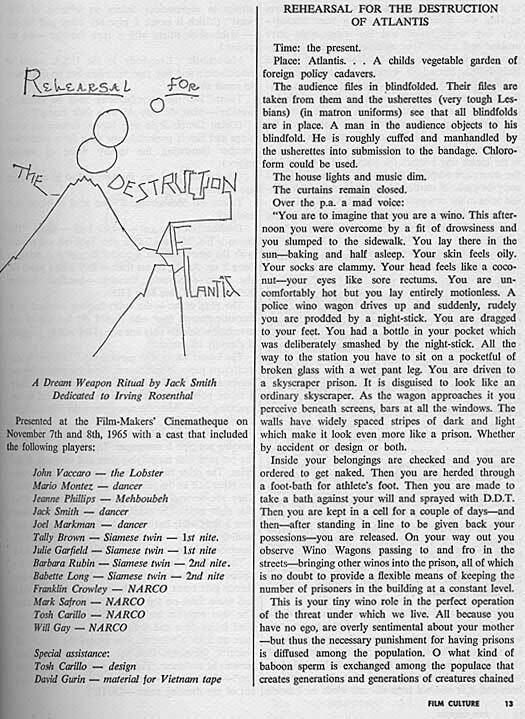 A further schedule of events appeared in the 11 November 1965 issue of the Village Voice. This included the group USCO (as in 'Us Company' or 'Us Co.'), who were mentioned in David Bourdon's quote above. The USCO group, which combined the efforts of a poet, a painter, and an electronics innovator to produce immersive multimedia events, was based in an old church in the Hudson Valley but also performed in New York City, the San Francisco Bay Area, and at university campuses all across the United States. In the 1964-66 period of its most intense activity, the group projected slide and film collages, produced paintings that flashed and kinetic sculptures whose parts turned and scintillated or thrust up jets of water - all in an attempt to open audiences to nonlinear or even mystical experience... USCO was a countercultural effusion that also exhibited in major museums in the United States and Europe. It has been considered a key link in the development, variously, of 'expanded cinema' and 'visual music,' total environmental surrounds, and the internet. Bill Dunning ("Andy's Gang," Blockprint (Rhode Island School of Design), vol. 16, no. 21, April 10, 1967) reprinted in Alfredo Garcia (ed. ), The Inevitable World of The Velvet Underground, p. 125. "I just thought the [E.P.I.] show generally lost from beginning to end. When they did hit on something good they kept it up to the verge of insanity, like Gerd Stern's tromp last year. (Personally, I found Gerd Stern more entertaining)." In the same issue of the Voice as the above USCO ad, Jonas Mekas wrote about the first three programs of the New Cinema Festival. There was no use of the term "expanded cinema" in this particular column although he would use it in a later column. Now, this current gush, as much as one can generalize at this early (not so early, though) stage, is marked by an almost mystic drive towards pure motion, color, light experience. It has much to do with the other arts, painting, sculpture, happenings, environment, music, but the cinema aspects of light, screen (in a number of different forms), image (filmed or produced by other means), motion dominate these works. The surge is wide and intense. Note that Mekas, himself, refers to the festival as the the "New Cinema Festival" rather than the "Expanded Cinema Festival."